Inclusions and blemishes are structural imperfections which affect the clarity grading of diamonds. A diamond's clarity grade is based on how big and how visible its inclusions and blemishes are. Inclusions are largely crystals of diamond or a foreign material that has formed within the stone affecting the internal composition, while blemishes are flaws which affect the stone's surface. The size, number, color, location, orientation, and visibility of inclusions and blemishes are all taken into account when evaluating the clarity of a diamond. Distinct from polish defects, blemishes occur naturally and are not due to human errors during the polishing process. An "inclusion" is the industry term for any internal diamond anomalies, and "blemish" is the term used for the external. We should avoid the term "flaws" when discussing inclusions, because every diamond has them to some extent. What matters is how visible they are, and how many. Diamond inclusions form naturally during a stone's transformation from carbon to a rough diamond. 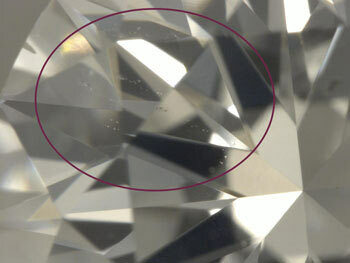 Contrary to popular belief, inclusions are not the result of a diamond cutter's mistake. 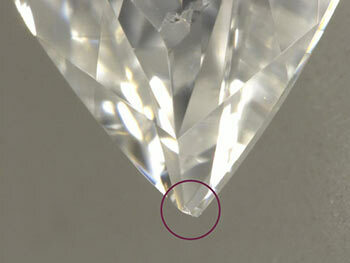 The most common diamond inclusions you will see are pinpoints and feathers. 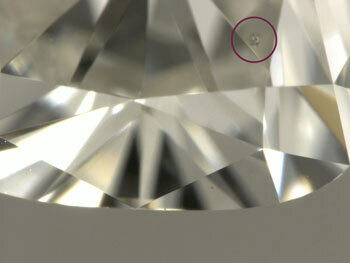 Pinpoints are basically the blackheads of diamonds; they appear as tiny dots on a diamond's "face", called the table. 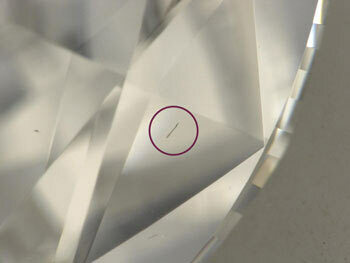 Another common inclusion is the feather, which is an internal diamond crack. With feathers, there are often concerns about a diamond's durability. However, a feather inclusion should not be cause for worry unless it runs most of a stone's length or if it reaches the surface of the diamond. The least common diamond inclusion you will see is a cavity. A diamond cavity is a miniscule hole, just like a cavity in your teeth. The reason that diamond cavities are so uncommon is that stones with too many or too large of this type of inclusion will be designated as industrial grade rather than gem grade. So, unless you're examining a lot of diamond tip saws and drill bits, you won't see very many diamonds with cavity inclusions. Diamond graders at labs such as the GIA and AGSL do use a set of general priorities to determine how seriously a stone's inclusions will affect its grade. First, a diamond grader will look at the inclusion's size. Naturally, an enormous inclusion that takes up most of the diamond's table will be more detrimental to the stone's clarity grade. The second priority is how many, and the range of different kinds, of visible inclusions a diamond has. If a diamond's table is riddled with clouds (groups) of pinpoints, feathers, and crystals, it will receive a lower clarity grade. 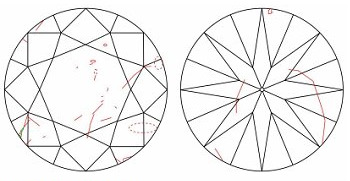 The third consideration is the position of the diamond inclusion. Diamonds are graded from the top down, at 10x magnification. If a diamond has an inclusion on the bottom of its pavilion rather than the table, the inclusion will be less important to the clarity grade. Fourth priority is given to the nature of an inclusion. By nature, I mean whether the diamond's anomalies are internal or external. 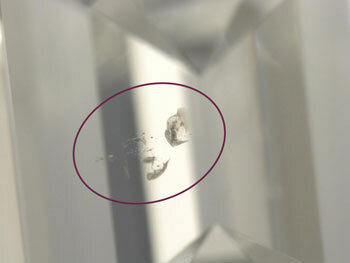 External inclusions are much more visible, and thus more harmful to a diamond's clarity grade. However, a diamond with only external inclusions can still be graded as Internally Flawless. Only diamonds with no blemishes or inclusions (visible at 10x magnification, that is) can receive an overall clarity grade of Flawless. Clarity Characteristics - A sample inclusion plotting chart. Will Some Diamond Inclusions Devalue A Stone More Than Others? External blemishes have more of an impact on diamond grade and price than internal inclusions. Something like a chip or break is much more obvious to the eye, and thus worse for a stone's clarity grade. However, these blemishes are rare and usually occur after the diamond has been cut and graded. Chips and breaks can happen as a result of poor ring setting or everyday damage. Diamonds may be the hardest material, but a tough hit against a sink or countertop can still chip them. Certain cuts and ring settings will hide the appearance of diamond inclusions. Many faceted diamond shapes, such as radiant and princess cuts, are especially good for obscuring inclusions on the diamond's table. A ring with a prong setting will hide an inclusion on the diamond's girdle, and bezel settings will hide inclusions on the pavilion. 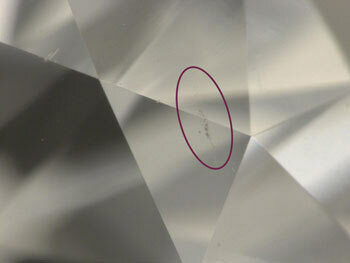 On the other hand, diamond cuts with fewer facets on the table are more likely to show inclusions. Examples include emerald and asscher cut diamonds. 1) It's important to remember that all internal diamond inclusions, most external inclusions, are completely natural and part of every diamond. 2) Most reputable jewellers loose diamonds have clarity grades of VS1 or VS2, which stands for very slightly included. Overall, most GIA certified diamonds have clarity grades in this range. 3) You don't have to worry about finding an inclusion on your diamond that you were unaware of. If you choose a diamond seller that has high quality imagery and GIA certified diamonds, you won't be surprised by any inclusions. The GIA plots out all of a diamond's inclusions on its grading report. Cavity: Essentially a hole in the diamond's surface, cavities can be found in a range of sizes and locations across the stone. Depending on its placement, a cavity could affect the overall durability of the stone. Those on the table are likely to be most visible when set in jewellery, compromising the diamond's value and quality. Chip: Sometimes created during the cutting of a diamond, chips are shallow indentations at the surface of the stone. Clarity plot reports will indicate where they are located. If at the edge of the diamond, it may be set so as to not be visible. A bruise is a chip that has caused feathering at its edges. Pinpoint Clouds: More significant clusters of tiny pinpoints are referred to as pinpoint clouds due to the white haze they create. They appear as a translucent cloud inside the diamond, and cannot be seen by the naked eye. Clouds are defined as a dense grouping of tiny pinpoints, consisting of microscopically small dust like voids or impurities. The clusters create a cloudy zone which even at 10x magnification may not resolve as individual pinpoints, thus affecting the clarity. Diamond Crystals Or Mineral Inclusions. Feathers: Feathering is a fissure within a diamond that was likely created billions of years ago, when the diamond was first forming. 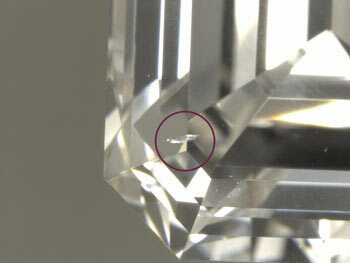 The location and size of a feather can affect the clarity grade of its diamond. If located towards the edges, prongs can easily hide a feather. They are only considered a durability issue if found close to the girdle, or as an opening on the surface of the stone. These are cracks within the stone that resemble feathers. The durability of a diamond is usually only affected if feathers reach the surface of the stone, which is more susceptible to damage. Small feathers under the surface do not normally create problems. Cleavage planes or internal stress fractures can look like feathers, although these are more commonly found, surrounding included crystals. Knots: A knot is a diamond crystal inclusion that breaks to the surface of the finished diamond. 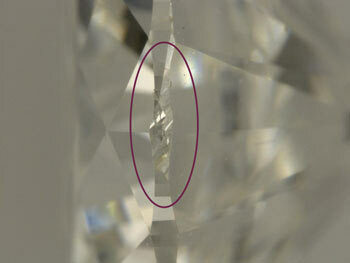 Under intense magnification, it should be clear where the difference is between the inclusion and the larger stone. During polishing, drag lines can be created as the polishing wheel travels across the inclusion. The knot may be raised above the rest of its facet: depending on its size, you may be able to feel it as you run your finger over the diamond. Indented Natural: Technically a blemish - as it appears on the outside of the diamond's structure, a natural is an unpolished part of the diamond. Originally part of the rough diamond's 'skin', these are usually found on or around the girdle. If they travel to the crown or pavilion, they will be considered Indented Naturals. While included in a clarity plot, they do not affect the overall quality or durability of a diamond. Unlike other blemishes or inclusions, Naturals have always been there and are mostly appreciated as a reminder of the diamond's organic history. 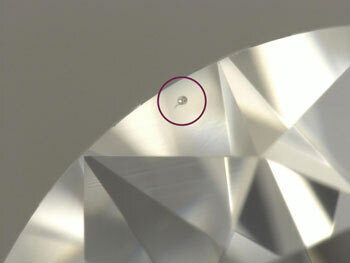 An indented natural is one which dips below the polished diamond's surface. If a diamond has an indented natural, it would not receive an IF clarity grade because the indented natural counts as an inclusion. Needles: A needle is similar to a feather inclusion, but with only one elongated, very narrow line. They do not typically affect the light return from the diamond, and can be either white or transparent. Some needles can be much longer and therefore more visible than others. They appear as a streak of light inside the stone and can sometimes appear in clusters, affecting the overall clarity and value. Pinpoints: Typically, a pinpoint inclusion is what separates a VVS1 clarity grade from an IF clarity grade. 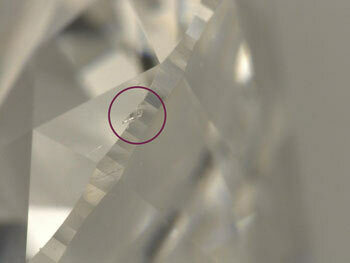 A tiny speck within the diamond, they are usually only detectable under high magnification. They do not affect the overall durability of the diamond. Pinpoints are tiny light or dark crystals present within a diamond that appear either by themselves or in clusters. Twinning Wisps: Twinning wisp (sometimes called intergrowth) is the result of growth defects within the diamond's crystal structure. Different inclusions that have twisted together, they are most commonly found in fancy cuts such as pear-shaped diamonds. With a white striped appearance, these groups of inclusions are generally more detectable than others. They are therefore typically found in diamonds of lower clarity grades, such as SI1. These particular defects form as a result of the crystal entwining into a trail during the original stone's growth. This can also be accompanied by graining and strain. Internal and external characteristics of the diamond you plan to purchase are shown on an easy to read diagram on the diamond grading report. Each inclusion or blemish is indicated with a small symbol in the location of the inclusion.